It's been a while since I've written a 'Trend Talk' post [you can read my first one here] so I thought- what better time to write another one than autumn/winter? A/W fashion has definitely got to be one of my favorite fashion seasons. Comfy sweaters, boots, hats.. Not to mention that September is like, the January of the fashion world. One September, I'll be at London Fashion Week, you wait! One of the trends that has caught my eye recently has definitely been tartan. Usually paired with some grunge, I can only insist that this look is due to be big this season. Yes, it MAY just remind you a bit of your school skirt [or kilt if you're super lucky like me..] but paired with the right accessories, I think this look is totally something I would wear. Big on the catwalks of Celiné, Marc Jacobs and Moschino, who have brought trad tartan to life, this trend is definitely for the fashion conscious! My favorite way to style a staple item like one of those below, is with leather boots and chunky chain necklaces. 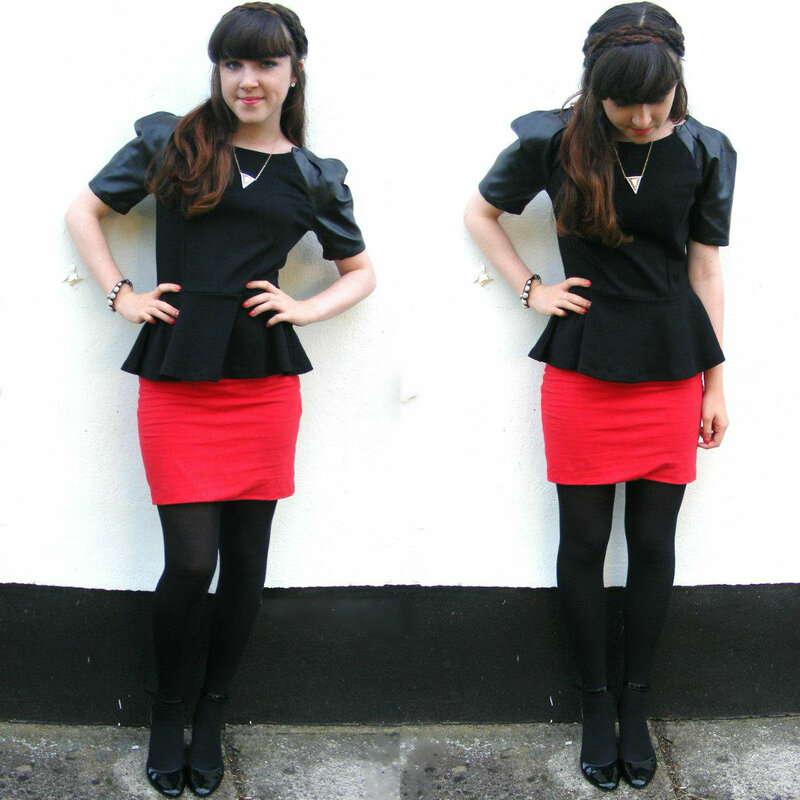 I've already spied a gorgeous tartan dress in Penneys/Primark for only €17! Think Scottish kilts with a bit of Courtney Love- edgy, witty and modern. If grunge isn't your thing, try a preppy plaid pinafore with lace socks. Too girly? Throw a denim jacket over a tartan dress and cowboy style boots for some chilled out vibes. The list is endless- it just depends how YOU eye it up. Below are my favorite tartan picks from high street stores. Although red is a common colour, dont be afraid to challenge colours like navy, forest green and and burnt orange. Will you be digging out your old school skirt this A/W? Do you dare to wear tartan? I wore the below outfit to my best friend's mam's wedding afters yesterday, hence the naff title ['hairspray', anyone?]. I had been looking for an evening outfit that I could wear to a few upcoming events this season, and I am delighted with what I got! "Not all that glitters is gold"- but these shoes certainly are. Although I must admit, they're a pain to wear.. but as they say, beauty is pain! I also had a few roles myself in the wedding- I did the nails of the bride & my friend, and also my friend's hair AND makeup! As you can imagine, I was under pressure to get the look right [i am a bit of a perfectionist] but it was all worth it in the end. With her permission, I'll post a few photos of the end result below. Enjoy! smudged nails aren't exactly a great look..
And just in case you want to listen to my cheesy song title.. 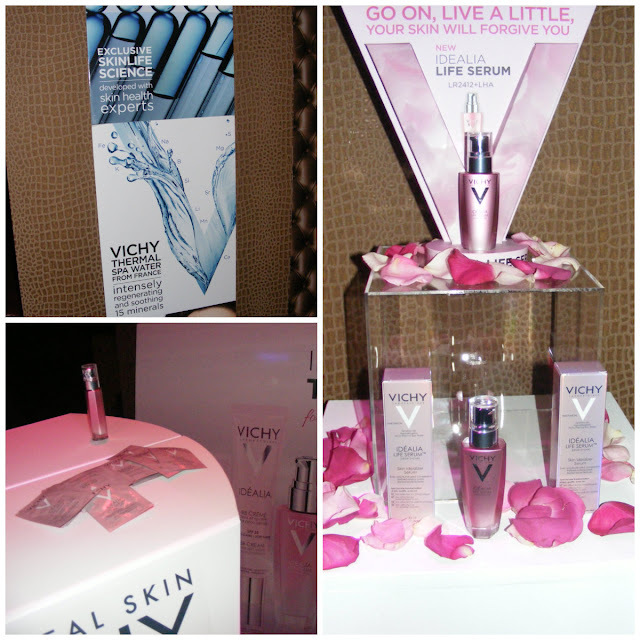 I recently attended the launch for a new Vichy product- the Idealia Life Serum. It was held in an oh-so-glamorous venue, The Black Door on Harcourt Street. I'm sure you all know by now that I adore new skincare products, and I love looking after my skin, and treating it the best way possible. Truth be told, I don't actually own an Vichy products- I think the price tag has been throwing me off! I'm very cautious when it comes to buying "expensive" products, as I like to ensure they're worth the money. SO as you can tell, I was very excited to try this new product. Vichy has always been a brand that I've heard so much about, and I'd typically associate it as a pharmaceutical brand [their TV ads do seem to have alot of jargon], but my grandmother has been a lover of the brand for years, and swears by their products! The Idealia Life Serum is a serum clinically proven to improve the effects of daily excesses, such as stress, unbalanced diet, exposure to the sun and pollution. It claims that the serum leaves your skin "looking radiant and fresh, and the texture feels refined. Facial features look more relaxed and skin looks younger and healthier". At first I assumed that the product would be only for older/aged skin- not quite something a teenager would need! However even us teens tend to eat too much junk food, or sit in the sun too long. It also states that it can do all of this in 8 days! The serum has a gorgeous scent, as it contains jasmine. And the best thing is? Its free from parabens! The event itself was brilliant- there was music, delicious food and icecream! There was also a very informative power point presentation on the exciting new product. I personally can't wait to try the 8 day challenge and try out the serum myself. I'm also going to get my mam to try it with me, as I'm curious to see if it works a treat for older skin, too. Keep any eye out for a review very soon! P.S- you may have noticed that my blog layout has changed, and then changed BACK, over the past few days. As soon as I get a bit of money together I'm going to pay for a new blog layout! Nails- nailwraps by NCLA ! Wow, that title is definitely a mouthful, but I really needed to cram it all in! I feel like I haven't properly written a post in AGES, just photos after photos, so this post is well needed. Alot has been going on in my life lately! I guess I'll start with the easiest thing to talk about, which is the OOHLALA magazine launch and blog awards. It was so much fun! Although I wasn't up for any awards, it was great to meet some of my favorite bloggers and also see some clothes from Penneys A/W collection. Also, as some of you may know, I had work experience with KISS magazine all last week! It was brilliant- sitting there, in an office surrounded by people loving their job, made me realise that THATs what I want in life. I would love to work for a magazine like KISS, or any magazine at that. We had to do things like bring back clothes to shops, pick up clothes, think of ideas and we also got to make the DIY items for the craft page! The staff were all so nice. We also got our nails done by NCLA, which you can see in my next outfit post! If you would like to find out more about my work experience, simply drop me an email @ vogueandcouture@gmail.com . It was definitely an experience of a lifetime, and will definitely look good on on my CV when I leave school. I recently pplied for volunteering at the Dublin Fashion Festival, and I'm delighted to say I was chosen! I'm looking forward to the adventures that will bring too, and I'll be posting more about that nearer to the time. When I reach 150 followers on Bloglovin' [only 5 away guys!] I'll be hosting my first ever GIVEAWAY! I'm super excited, especially since I've never hosted one before. Lastly, I will be posting my first ever youtube video soon- stay tuned! UPDATES: KISS magazine work experience & OOHLALA launch/blog awards! I wore this outfit last Saturday going out for dinner, and figured it was a great opportunity to dress up a little! I had yet to wear the skirt- bought for €4 at a Siopaella sale. I felt quite grown up in the outfit, and it's definitely something I'll be wearing again. Let me know what you think!